Can't remember who I was talking to about sparkling iced tea. 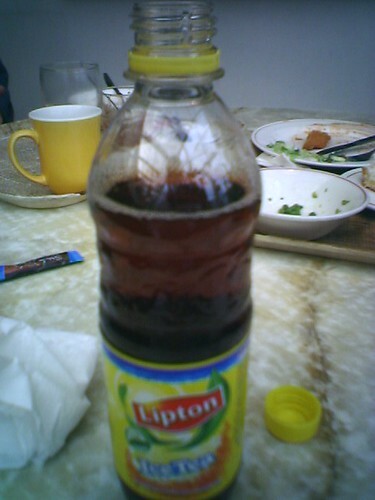 I had sparkling iced tea in Germany or the Netherlands, and totally loved it. Recently I started appreciating flavored seltzer a la Polar Beverages (I know, I know, its weird but this is not the first time). BTW, still can't seem to find the difference between Seltzer and Club Soda. Tastes the same to me....and no, seriously, don't tell me Seltzer is naturally effervescent....thats a load o' crap, because I don't think Polar is naturally effervescent! Sparkling Iced Tea, originally uploaded by swash buckler. Coca Cola and Nestle together came out with Sparking Ice Tea. Whats more, they claim that drinking 3 drinks of Enviga as they call it actually helps you lose weight. what a load of crap. I make my own iced green tea. I think I am going to patent my process. It turns out awesome. All I need now is a soda maker and gas my concoction for the best beverage out there.